(Guest post by ‘Blackpool Orders for Dog Control Action Group’) Residents of Blackpool are joining the facebook group ‘Blackpool Orders for Dog Control Action Group’ in opposition to the council’s draconian proposals to exclude dogs from parks, bridle-paths and other open spaces to include Stanley Park and Herons Reach under the new PSPO designed to tackle anti-social behaviour. The group is fast gaining momentum with nearly a 1000 members in two weeks, and more join every day as word of the council’s PSPOs spreads. Blackpool Council is following the lead of some many councils acting under the Anti-social Behaviour, Crime, and Policing Act 2014 to attack the responsible dog owning community. This legislation has given local authorities the power to use PSPOs to regulate any behaviour that could be deemed to have a ‘detrimental effect on the quality of life of those in the locality’, as judged by the individual officer(s) and/or councillor(s) who propose the order. Notably, as there is no legal obligation for councils to consult with the public before implementing a PSPO, the view of a single or small number of unelected officials can be all that is needed to take away the freedom to perform an activity in public. Under the proposals Blackpool Council is affectively closing the door to holiday-makers with their dogs, as well as making life miserable for their residents. A quarter of all households own a dog; this is a huge section of the population that Blackpool Council is alienating. Blackpool is an urban area with no access to the countryside unless you drive or are prepared to take the bus/train twice a day to walk your pooch. Blackpool’s parks and bridle-paths are so very valuable to residents, and to say that residents are excluded from them if they own a dog is unforgivable. The restrictions see borough wide ‘dogs on lead by direction’ and the number of restricted/exclusion zones now increases to 29 open spaces. The council has been asked to offer spaces for dog owners to exercise their dogs, but has given no response. One lady told us that councils have included grass verges in their ‘open space’ calculations when concerns over access to green spaces has been raised in the past. Five proposals are open for consultation, two deal with restricting and excluding dogs from open spaces across the borough, with a FPN of £100 that can could be increased to £1000 and a court appearance. Three more PSPOs are proposed to prevent more than 4 dogs being walked by a person; and only 2 dogs maybe exercised off lead. Clearly there are serious mental and physical issues with not exercising dogs sufficiently. Councils preventing dogs from having off-lead exercise on a regular basis actually criminalise owners under the Animal Welfare Act 2006. Local vets have given their support in providing statistics from their practices on the numbers of obese dogs, dogs suffering diabetes and other cardiovascular illness – all consequent of little opportunity to raise their heart rate which can only be done through running. There is also the psychological impact of one dog being tied to railings at the side of a grassy area, as the other two are allowed off lead to play a game of fetch with their owner. Demanding the power to scan your dog from a microchip is another problematic area. We are uncomfortable about the fact that any ‘official’ will be given the power to scan your dog. This may happen several times a day, depending on the stereotypical views of that ‘official’ and be hugely stressful for the dog. Why can’t the microchip certificate be taken to an approved office for the council and a tag issued by Blackpool Council to say this dog has a chip and has been approved? After all, the microchip database has a photograph and description of your dog. Stop and search powers to search a dog walker for a poo bag is another example of targeting a particular group’ and has been covered extensively in other articles. On completing an ‘information gathering’ survey (the official consolation process to you and me), residents were asked to select an age for a child to walk the family pet. People were asked to tick a box to determine whether someone under 10, 11, 12, 13, 14, 15 or over 16 should be allowed to walk their dog. What are our children supposed to do? Carry a note from their parents to say they are 12 years old? Relinquish the dog to be scanned so data can be collected to issue a FPN? Run away terrified and then receive a £100 FPN for none compliance? Are our children expected to carry ID cards? In a country where childhood obesity, anti-social behaviour and addiction to computer games are serious nationwide problems, Blackpool Council’s solution is to ban under-16s walking the dog? This is crazy and in direct conflict with the Kennel Club’s Young Handler Programme, The Dogs Trust educational programme, RSPCA as well as the numerous young handles at obedience and agility. Your age does not make you irresponsible. Feeling is now running incredibly high as people begin to realise the effect these proposed PSPOs will have on their life and their dogs’ welfare. We are receiving messages from residents and businesses who are trying to understand why Blackpool Council are wanting to go all out hitting residents and tourists with these draconian measures. Despite numerous attempts we are still unable to talk to anyone at the council or arrange to meet them as they are on summer recess until the 3rd September and no one is available to comment or help with questions from our many members. We do not understand why a consultation like this was published during the summer recess and holidays. We need questions answered and unfortunately this is not happening. We hope that Blackpool Council sees the damage it is about to do to 25% of its residents, visitors and businesses alike – not to mention the mental and physical damage to residents suffering depression, loneliness, anxiety for whom their dogs are their only reason to go out. We are sick of being targeted and will fight for our right to walk and enjoy exercising our dogs. You can join the group’s Facebook page here. 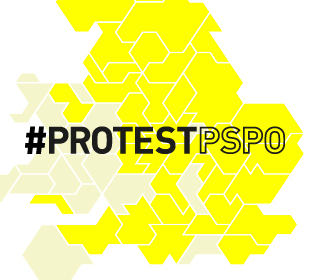 Sign a petition against the PSPO here.